Major League Baseball released the roster for the All-Star Futures Game and two Durham Bulls were nominated to the team. Pitcher Jeremy Hellickson and outfielder Desmond Jennings will be making the trip to Anaheim to play in the game to be played during all-star weekend. Hellickson is 9-2 with a 2.33 ERA and 90 strikeouts in 15 appearances this year. He was drafted by the Rays in round 4 of the 2005 Draft and is the organization's top pitching prospect. Jennings is hitting .273 with 13 doubles, 3 triples, 18 RBI's and 16 stolen bases for the Bulls this season. Jennings was drafted in the tenth round of the 2006 Draft by the Rays. He is the top minor league prospect in the organization and will be making his second Futures Game appearance after be nominated in 2009. 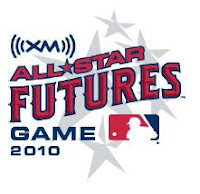 The twelfth annual XM All-Star Futures Game will take place on Sunday July 11 at Angel Stadium. The best prospects from minor league baseball were selected and will do battle as the US Team and World Team. The game will be aired live ESPN2.